I’ve passed taro root a few times in various places – a Whole Foods, an ice cream shop in NYC, a specialty grocery market in Hoboken and most recently, on FreshDirect. Usually, I love walking through a gorgeous Whole Foods or meandering through the Union Square Farmer’s Market for inspiration on what to cook. It’s therapeutic and empowering – seeing the crops that farmers plant and grow is truly moving. This time, I was sitting in my jammies, with a cup of coffee, scrolling through the “asian vegetables” on FreshDirect and spotted taro root. For whatever reason, I added it to my cart. I thought maybe I’d dice and roast it like a potato hash and make brunch over the weekend, maybe throw in some bacon and top with a fried egg. “Yea, that’s what I’ll do!” I said. When I went to peel it to dice it up for some prep, it struck me: why the heck aren’t I spiralizing this? Can I spiralize it? Obviously, I tried it. It worked – way better than I expected! It’s a pain to peel, because its outer skin is very rough (similar to yuca or a celeriac.) I mean, it grows in the ground – it’s a root vegetable. Anyway, I put it in the fridge and decided to sleep on it and when I’d wake up, I’d know what to do. Well, then I realized I’ve never tasted taro root and I don’t know what it tastes like. So, I sauteed some quickly in a skillet and oh.my.word. It tastes much like a sweet potato and has a lovely starchiness that makes it easily softened, like an Asian noodle. It almost has a mild coconut taste . Most importantly, it’s like a sponge – it absorbs flavor incredibly! [insert slaps against my forehead here] How’d I miss the boat?! Taro is most commonly found in Asia, Pacific islands, West Africa, and Amazonian regions of South America. Nutritional benefits? While it’s higher in calories than potatoes, it’s a better source of dietary fiber, it’s packed with complex carbs, and it has a lower glycemic index, meaning it won’t cause blood sugar levels to skyrocket. Taro root also contains a solid amount of B vitamins and potassium. Since taro does have that sweeter flavor, I thought it would pair nicely with a sticky glaze, treating this dish like a sinfully delicious Asian noodle stir fry. 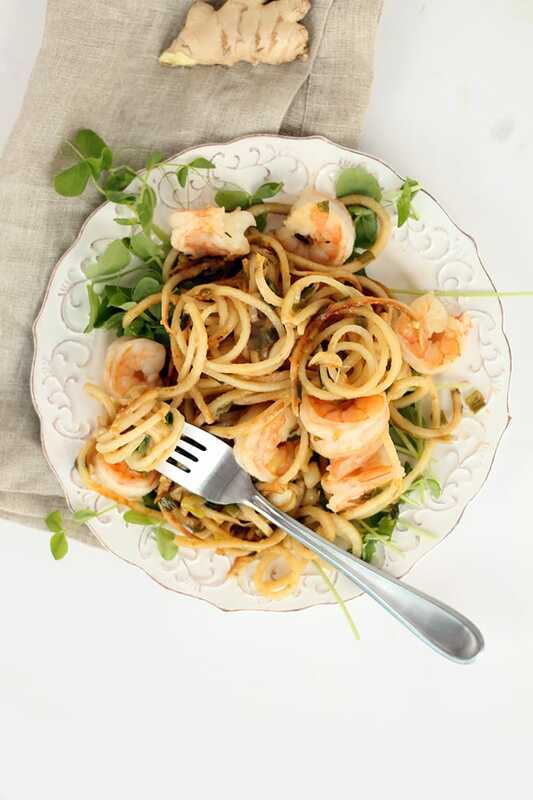 With garlic, shrimp and scallions – this recipe has everything. Plus – it only takes one skillet! Talk about easy cleanup. The pea shoots on the bottom add a freshness to the dish and soak up the flavors of the miso-ginger glaze. Frankly, they’re pretty. I can’t wait to keep experimenting with taro root. If you can’t find it near you, try Asian specialty grocers or Whole Foods. I hope you find it and make this recipe! Have you ever tried taro root before? What do you think? Fill a medium pot halfway with water and bring to a boil. Once boiling, add in the taro and cook for 5 minutes or until almost cooked fully. Drain and set aside. Combine all of the ingredients for the miso-sauce into a food processor and pulse until creamy. Taste and adjust to your preferences. Set aside. Place a large skillet over medium heat and add in the oil. Once oil heats, add in the garlic and scallions and let cook for 2-3 minutes or until scallions soften. Add in the taro noodles, pour in the miso sauce, toss to combine and then add in the shrimp. 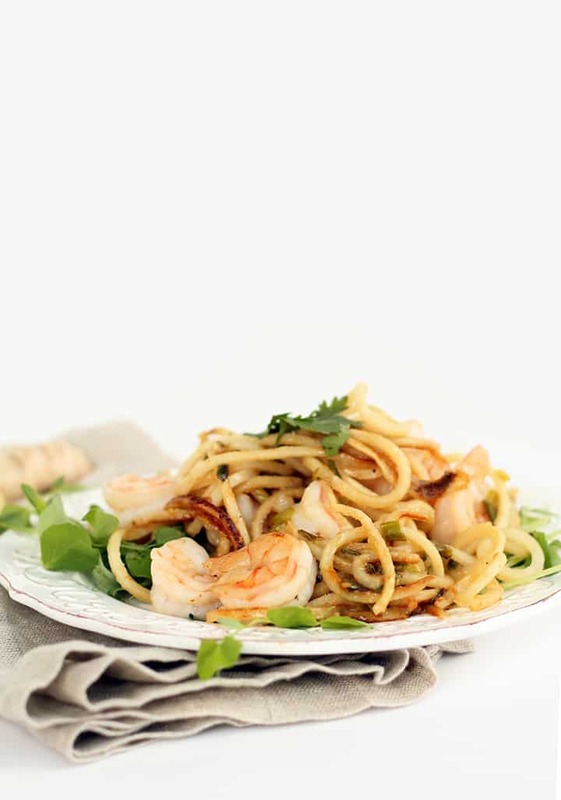 Cover the skillet and cook for 3-5 minutes or until tarot noodles soften and the shrimp are opaque and cooked through. Prepare your plates. 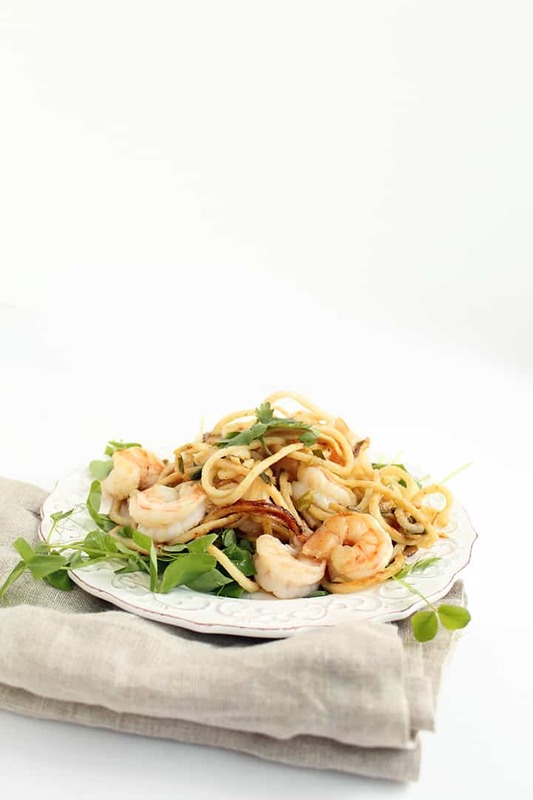 Fill each plate with 1 cup of pea shoots and top with even amounts of the taro and shrimp noodles. Garnish with cilantro and serve. I. don't think I know what taro looks like, a picture would have helped. Sandy - you can Google it, but I've included a photo at the end of the best! Hope that helps. You're right, I should have. Thanks. The high sodium content is due to the use of miso paste, soy sauce and rice wine vinegar, mainly! These ingredients pack a high sodium count, unfortunately! I have never tried taro root, but it sounds very good. Glad you posted a picture of it, so I know what I'm looking for. It seems to me that spiralizing yucca would be nice, too. That is readily available in markets where I live. The only way I've used that before was to cut it in chunks to cook, and it came out with a texture liked baked russet potatoes. I like the idea of spiralizing it, though, because that makes it easy to handle the central core. Not sure how it would cook as noodles. Would probably use blade B on it. Does your market advise you not to eat Taro raw? According to my Google search,it must be cooked to avoid toxic problems. Even the leaves must be cooked. " Taro root is easy to digest and healthy. However, don’t eat it raw! As healthy as it is cooked, taro root is just as toxic uncooked. Read on to learn the nutritional benefits of this highly underrated root vegetable. Taro is the root of the taro plant and is full of nutrients. But, the root cannot be eaten raw due to its calcium oxalate content. (Calcium oxalate is associated with gout and kidney stones)." The taro is cooked in this recipe! Love the idea of trying something new, but sadly, I won't be able to use this recipe. As someone who follows a plant-based diet, I naturally skip over the shrimp and just plan to add more veggies. That was okay until I got to your nutritional breakdown. This is where it gets iffy. I agree 100% with Anonymous about the incredibly high sodium content, I'm hoping that would be lower sans the shrimp. The sugar is way too high for someone with Diabetes and the Cholesterol is too. Dang! I'll be looking forward to learning other tricks and tips you come up using Taro as I know you can! Thanks for the great info and beautiful pictures - they make my mouth water! Marcia - the high sodium content is due to the use of miso paste, soy sauce and rice wine vinegar, mainly! These ingredients pack a high sodium count, unfortunately! 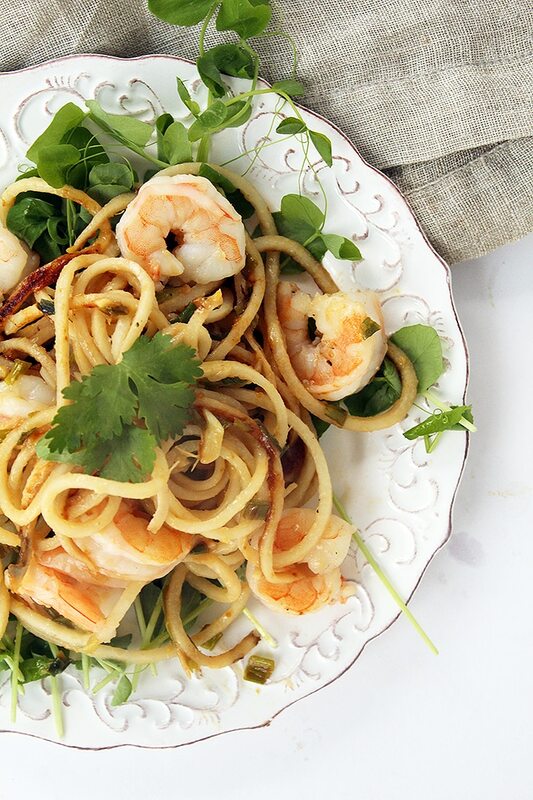 Shrimp is a great source of potassium, which helps counteract the effects of sodium. Also, taro is a high source of potassium as well. Together, with the consumption of water, this high sodium count isn't as negative as it seems! Of course, if you are watching your sodium levels, this meal is not for you.m Hope this helps! WOW - I don't think I would've eaten taro root in this lifetime if not for you, Ali! I probably wouldn't have found the most amazing international produce market right in my backyard, also, if not for you, Ali! 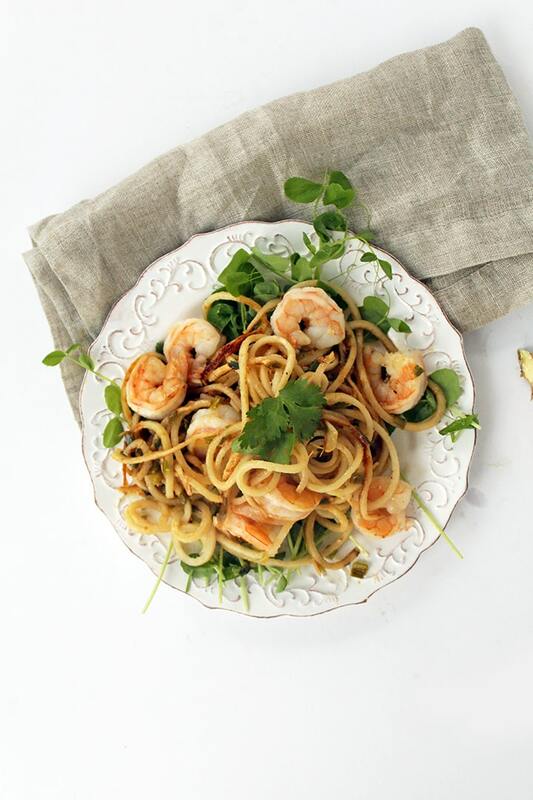 I knew this recipe would be sublime when I read it and it truly was - yum! Thank you so much for what you do and please continue to cha cha change and cha cha challenge us to enjoy the foods that truly nourish us. We used to live in Hawaii and it was well known that undercooked Taro can feel like you're swallowing broken glass ! ;) Just be sure they are cooked fully. Ali, I don't know if this will fall on deaf ears, as you seem so busy lately! But a friend sent me a link to your blog recently, and I've spent the last week making my dinners from here. I've had a spiralizer for over 2 years, but bought it for raw meals, and didn't realize I could use it in so many different ways! Earlier this week I even improvised and did butternut squash in blade b with a mole sauce that I had in the freezer. Wow... And so, I tried this last night, with the miso-green-tea soup for first course. They were outstanding! Here are my two tips for anyone reading this. 1. The noodles spontaneously shortened to about 2" pieces while boiling. I think I had the water too hot and "rolling". Next time I'll try lowering the heat a little. (No worries... it was still amazing) 2. In my Toronto, Canada grocery store, the sign said "dasheen", and not "taro". Luckly your picture helped save the day, and a quick verification via smartphone to wikipedia confirmed that it was the one and the same. THANK YOU for this delicious recipe. I hope you do find more uses for taro! My daughter and I made this tonight and it was a huge hit. We did change some things slightly. My bad I didn't google taro root before I went in Earthfare, and all the root vegetables weren't labeled properly, so I came home with celeriac. It actually worked though for a crowd! I added one zuccini, one yellow squash, to my two celeriacs. I also replaced the honey with coconut palm sugar and put a little bit of mirin in the sauce. It was amazing! My kids even ate it, every bite, willingly. Thank you for another amazing recipe! This sounds amazing! Would have never thought of spiralizing or even trying Tara Root. This is such a brilliant way cooking taro. I must try it now! Yes! Let us know how it is!